BRITISH PRIME MINISTER Theresa May is set to formally request that Brexit be postponed. May is due to write to the European Union, likely asking it to agree to extending Article 50 until 30 June. A three-month extension would mean Britain doesn’t have to take part in May’s European elections; the new European Parliament is set to convene in July. Other EU member states are expected to consider her request at a summit in Brussels tomorrow. However, European Commission President Jean-Claude Juncker today said a decision is unlikely to be reached this week, meaning a second summit may be needed next week. Juncker told German broadcaster Deutschlandfunk that the remaining 27 EU members states’ hands are tied until the political indecision in London is resolved. Juncker insisted the deal on the table is the EU’s final offer. If other scenarios are being discussed, we’d need a new road. Juncker said May needs to present Brussels with an agreement approved by the British parliament as well as “a clear timetable”. Britain is currently set to leave the EU on 29 March, just nine days from now. 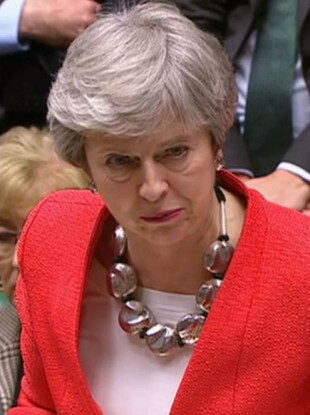 May’s appeal for an extension comes amid doubt over whether or not the House of Commons will vote on her Brexit deal for a third time. The planned vote was thrown into doubt on Monday when John Bercow, Speaker of the House of Commons, said the government cannot have another meaningful vote on the deal if changes are not made to it. Bercow said MPs from both sides of the House had expressed concerns to him about being asked to vote repeatedly on the “same fundamental proposition”. Solicitor General Robert Buckland has claimed the UK is facing a “major constitutional crisis” as a result. May’s official spokesman yesterday agreed there is “a crisis” afoot but blamed MPs who didn’t back the draft Withdrawal Agreement struck between the British government and the European Union. Bercow cited a ruling from 1604 to justify his decision to block another vote on the deal – it was overwhelmingly rejected by MPs in January and again last week. The majority of MPs (413) last week voted in favour of extending Article 50 for three months, with 202 voting against the government’s motion. Some people have argued that postponing Brexit is somewhat pointless as European leaders have said the deal struck between Britain and the EU cannot be renegotiated, while hardline Brexiteers view it as a tactic to stop the process altogether. There was a “blazing row” at a British Cabinet meeting yesterday, according to Sky News, with some ministers reportedly saying any delay must be brief — meaning there is the possibility of Britain leaving without a deal at the end of June. As the crisis rumbles on, a number of opponents are said to be eyeing up May’s job. Former Foreign Secretary and Brexiteer Boris Johnson is one of the frontrunners – something that could further split the Tories, with some MPs vowing to quit if he becomes leader. Tánaiste Simon Coveney, meanwhile, has said there is “a lot is concern” among EU member states about the prospect of a long extension of Article 50. Coveney added that it has been “very clear” there is “absolutely no appetite” from the EU to reopen negotiations on the Withdrawal Agreement. Many politicians have raised concerns about the backstop element of the deal, which aims to avoid a hard border between the Republic and Northern Ireland and could see the North stay aligned to some EU rules. Negotiations to get the DUP and other MPs, including some within May’s own Conservative Party, onside are ongoing behind the scenes. Email “Theresa May faces battle to get EU to delay Brexit as Juncker says 'we've reached the end of the road'”. Feedback on “Theresa May faces battle to get EU to delay Brexit as Juncker says 'we've reached the end of the road'”.